The atumpan is the main talking drum of the Akan people. It is the most favoured instrument to play the bass part to accompany dancing. The atumpan is an open goblet drum on a base. It is played in pairs, usually by a master drummer using two angular sticks. The membrane is stretched across the head of the drum inside a metal ring, which is anchored to 7 to 8 conical pegs around the outside of the drum. The atumpan drum measures approximately 1 m in height and has a diameter of 45 cm at the top. Because of its weight, it is placed in a wooden stand at an angle during play. Alternatively, two long wooden sticks are inserted in two holes where the conical pegs usually go. The drums then rest on the sticks (Dagomba, Mamprusi). Among some peoples, like the Sissala for instance, a stick is hammered into the ground and the two drums are secured with ropes. The atumpan is made from one single piece of wood. It is open at the bottom and the base is much narrower than the main body of the drum. 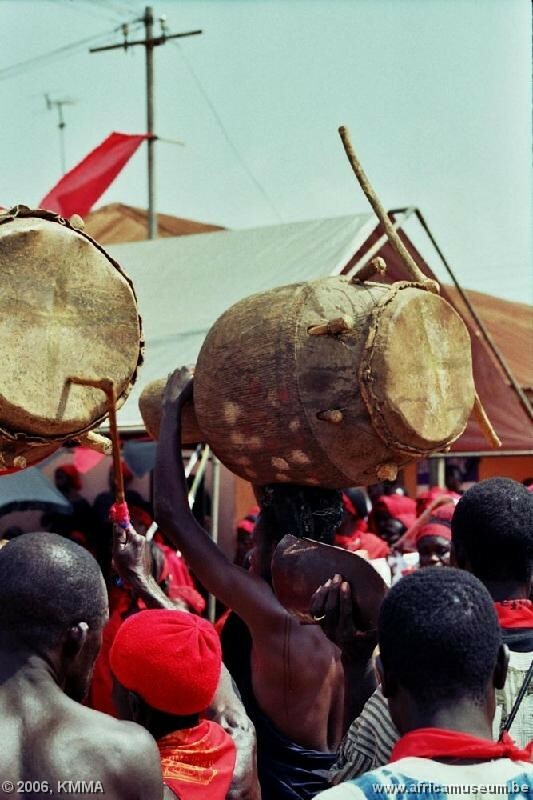 During parades, one person carries the atumpan on their head whilst a second person walks behind and plays. 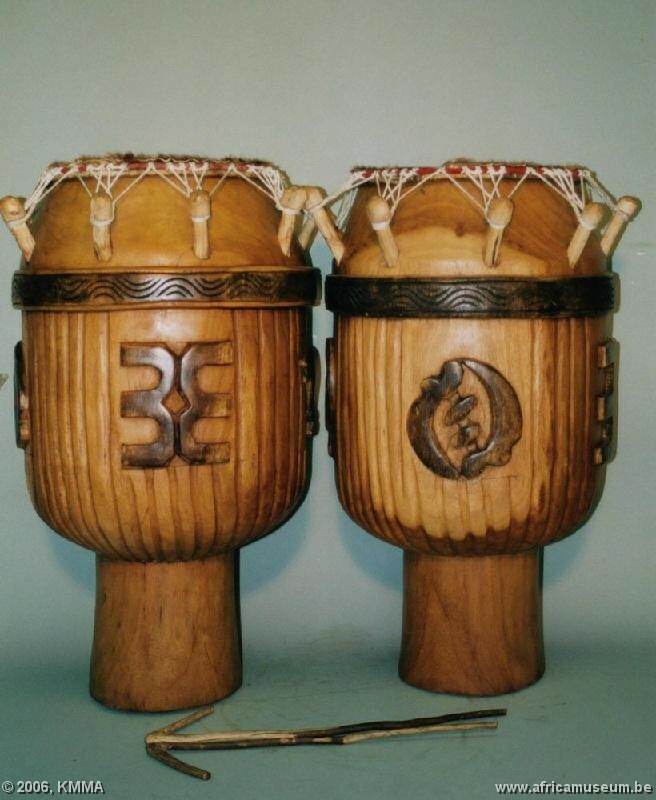 The two atumpan drums are tuned to each other. The lowest tone is identified with the mother and symbolizes woman. The highest tone is identified with man. These two sounds are needed to send signals from one village to another. The Akan language is a bitonal language with a middle tone. The atumpan is therefore ideally suited to send messages. The sound of the drums is determined by the size of the drum: the larger the drum, the larger the membrane and the lower the sound. The atumpan is played with two wooden sticks and the membrane can also be damped with the palm of the hand or struck with the fingers. 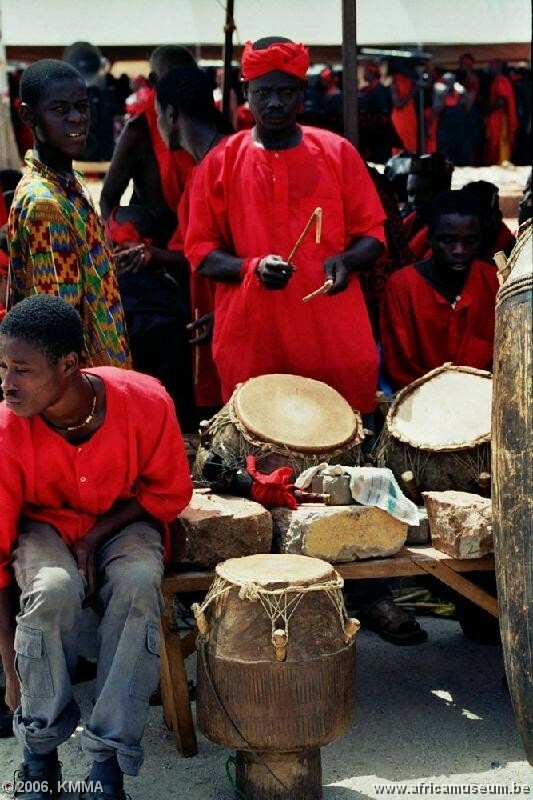 It is traditionally played by a master drummer (Dagomba 'Akrama'). 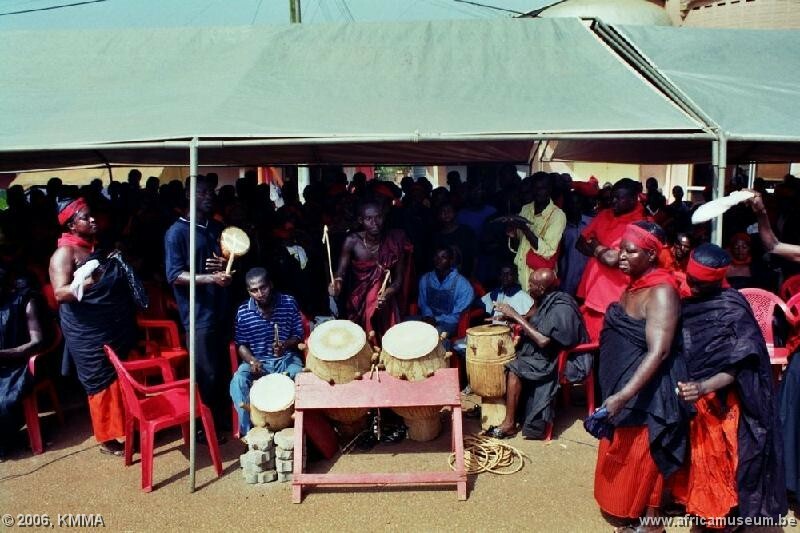 Traditionally the drums are adorned with decorative elements derived from adinkra symbolism, e.g. Gye Nyame, Afenan, Adwo, Wawa aba and Sankofa. Some drums are covered with a fabric with geometric figures (diamonds and rectangles) and others are painted with blue or grey paint. In some the natural colour of the wood has been preserved. The atumpan drum is made from the hard durable wood of the Tweneboa tree. Sacrifices used to be made to the tree - usually an egg - and prayers were said before the tree was cut down. The drum is identified with the spirit of the tree (Nketia 1957,p5). The atumpan is considered sacred by the Ashanti, who attach no blood, jawbones or skulls to it (Rattray 1923,p263).